Streamline | The Official Filmstruck Blog – John Wayne – American Adman! John Wayne – American Adman! One of the world’s most widely beloved movie stars is John Wayne (TCM’s Star of the Month) and throughout his celebrated career, Wayne endorsed a number of notable products and causes. Regular readers may have noticed that I’m fascinated with advertising, particularly the way that Hollywood stars like Wayne have used their likeness to sell us goods and cultivate their public image. As I mentioned last year in a piece I compiled about Barbara Stanwyck, product placements and celebrity endorsements are as old as Hollywood but modern audiences are often unaware of them. When we see Clifton Webb furiously tapping away on a Remington typewriter in Otto Preminger’s LAURA (1944) for example, it’s easy to overlook the fact that it was probably a carefully selected brand tie-in. And while Webb was typing on his Remington, his costar Gene Tierney was using her timeless beauty to sell Royal Crown Cola in an effort to promote herself and her upcoming film, A BELL FOR ADONO (1945). These tiny details and seemingly useless facts might not mean much to most film viewers but I think the lasting impact of some Hollywood stars can be linked to the ways in which they sold themselves to the public when they weren’t appearing in films. John Wayne is recognized today for the movies he made but he also endured himself to audiences through product endorsements in popular magazines like LIFE and The Saturday Evening Post. In the 1940s and 1950s, Wayne became a friendly and familiar face in film as well as television where he appeared in a number of commercials. What follows are some of my favorite examples of John Wayne – American Adman! This ad for Adam Hats announcing that “John Wayne wears an Adam” might be one of the oldest ads John Wayne appeared in. I haven’t been able to precisely date it but I do know that it’s from the early 1940s and was most likely printed between 1942-1945. The early westerns John Wayne appeared in were very popular with kids and like many western stars from the era, Wayne lent his celebrity to a number of products aimed at younger audiences like these cap gun sets. The first set was produced by Chauncy Toy & Novelty Co. and I believe it was made in 1947 in association with the release of ANGEL AND THE BADMAN (1947). The second set by McKinnon was produced in 1960 in association with the release of THE ALAMO (1960). In the late 1940s, Wayne also started appearing in his own comic book series aimed at his young fans. This ad for Royal Crown Cola, which has Wayne proclaiming “Sure as shootin’ R.C. taste best!” was produced in support of WAKE OF THE RED WITCH (1948) and was originally published in a comic book. In 1950 John Wayne started hawking more adult products like Rheingold Beer. The oldest Rheingold ad I could find featuring Wayne was from 1950 and considering his mustache, I suspect it was originally published in association with RIO GRANDE (1950). Wayne worked with Rheingold for at least a decade repeating the claim that “My beer is Rheingold.” The other ads were made in conjunction with LEGEND OF THE LOST (1958) and THE ALAMO (1960). Wayne was a heavy smoker and in the 1950s he started endorsing Camel cigarettes. In one of his early ads for Camel, Wayne says, “The roles I play in movies are far from easy on my voice – I can’t risk throat irritation. So I smoke camels – they’re mild.” He also started appearing in television commercials for Camel. The one posted above is from 1952 and was shot during the making of BIG JIM MCLAIN. In support of the release of THE QUIET MAN (1952), Wayne lent his image to Dixie Cup and offered a “Colored Picture of Me” to anyone who managed to eat 12 cups of Dixie Nelson’s Cloverland Ice Cream. In 1953 Wayne encouraged Americans to drink more coffee with this Pan-American Coffee Bureau ad put together by corporate interest groups. In association with the release of HONDO (1953), Wayne also sold Whitman’s chocolate with the claim that “It says what you want to say – in a way folks like.” In the ad he’s pictured giving a Whitman’s Sampler box to a “fellow worker” who happens to be a pretty smiling woman who seems to be holding a script. I can’t place her but maybe you can? Wayne also used his star power to support causes he felt strongly about, which is evident in this Christmas Seals commercial from 1955 shot during the making of BLOOD ALLEY. Wayne was an avid hunter and officially endorsed Wheatherby rifles in 1956. The tall handsome actor was also an avid fisherman and in 1957 he lent his image along with a favorite recipe to Star-kist Tuna in support of the release of JET PILOT. In this cute ad for Remington shavers Wayne, along with his lovely wife Pilar Pallete, share what they’re (supposedly) giving each other for Christmas in 1958. When THE ALAMO was released in 1960, Wayne endorsed a number of products aimed at kids including Popsicles. Wayne did a lot of traveling and in 1961 he endorsed Air France. In the 1960s, Wayne seemed to lesson his involvement with advertising. I suspect that this was due to his health problems following his lung cancer diagnosis in 1964 as well as the fact that he was getting older and falling out of fashion with young film audiences. Interestingly enough, one of his next endorsements was for the Southern California Visitors Council in 1970 encouraging would-be travelers to vacation in Sol Cal. By the late 1970s John Wayne’s All-American image and cowboyish charms were now part of our shared national myth. He was a Hollywood legend and Wayne successfully used his clout in these commercials for US Savings Bonds and Great Western Savings & Loan. Wayne also started selling pain medication for Datril in 1977, which was a sad reminder that he wasn’t getting any younger. And a few short years later, Wayne would be dead due to complications from stomach cancer. The most important and enduring ads and commercials that The Duke appeared in were made for The American Cancer Society. Cancer was (and still is) a dirty word that nobody wants to hear about much less discuss. Before cancer killed him, Wayne successfully used his star power to help promote cancer awareness, particularly with older men who were less prone to visit the doctor and today The John Wayne Cancer Foundation is still going strong. Wayne’s widely seen and hugely popular ads and commercials undoubtedly saved a few lives and helped the American public better understand this life threatening disease. That’s a legacy worth remembering. 13 Responses John Wayne – American Adman! Not an official endorsement per se, but the good folks at Vespa motorscooters were very good at getting Hollywood stars to pose with their cycles while visiting Italy, and in turn used the photos for promotional purposes. There’s a great shot of Wayne sitting on one of their models, probably from when he was in Rome working on Legend of the Lost, but no proof that he ever actually rode one. Obviously the most famous celebrities associated with Vespas are Gregory Peck and Audrey Hepburn, but Google “celebrities” and “scooter” and you’ll get some other fun photos from Vespa’s sneaky promotional chutzpah. This post reminded me of T.V. commercials I saw in the 1960′s and later, none of them with the Duke. To have seen him on T.V. would have been like breathing air, he was so much a part of American culture. Of the ones I do remember, there is Bette Davis in an orange commercial, Stanwyck and ex-husband Robert Taylor in a coffee commercial and later Ricardo Montalban for the Chrysler Cordoba and it’s “Corinthian leather”. I don’t recall Crawford doing a commercial for Pepsi but she was certainly an ambassador for the company. Sorry, left out the word “juice” after orange in my previous comment. Kimberly, once again thank you for a treasure trove of great images and videos! There’s nothing wrong with cashing in, using your image to promote items and causes. I remember how shocking it was to see Yul Brynner’s anti-smoking PSA right before he died. I’m guessing that Duke Wayne had very good ‘representation’ to utilize his celebrity in such a variety of advertisements. Thank you so much for this, Kimberly. This may be my favorite post of yours ever. Thanks for all the feedback & kind comments! 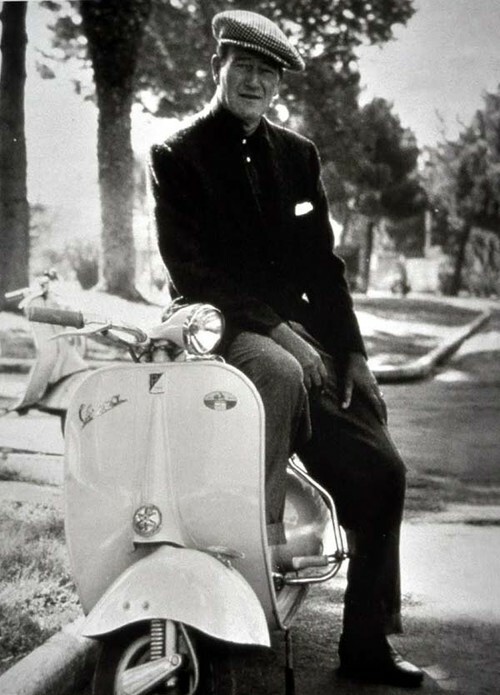 Love that Vespa pic, Swac. And I’m glad folks enjoyed the post so much. It was fun to compile. That was a fun post! Davy Crockett packed a six-gun! Who knew? Wow! I like these ads. These were so much fun, but somehow I can’t quite associate tuna with John Wayne. This was great fun and really informative, Kimberly. Fun article and I greatly enjoyed it. The tuna ad also cracked me up a bit and Rheingold beer-have never heard of it. I think the actress accepting a Whitman’s chocolate looks sort of like Jane Wyatt from the side, but I don’t know if she and Wayne ever appeared in anything together. Did he guest on Father Knows Best perhaps, the show where she was the mom? Rheingold Beer (“It’s extra dry!”) was a popular brand in the northeast U.S. and elsewhere, especially in the ’50s & ’60s, although according to that Wikipedia article, there was a recent attempt to revive the brand. I believe I saw it in some stores during a recent trip to Maine.